The plays weren't pretty, the passes weren't crisp, and the athletes weren't often upright, but Monday's senior bubble soccer tournament drew quite a crowd. Classmates, faculty, and staff stopped by the field to take in the spectacle: teams of students (and one intrepid faculty team) colliding, wobbling, and flailing during 5-minute, small-sided soccer games played inside of inflatable zorbs. 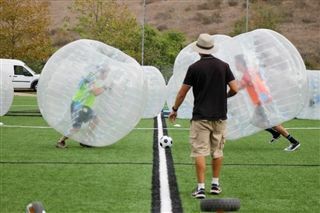 The bubble ball tournament succeeded in providing seniors with some well-deserved fun and relaxation amidst tough academic schedules and looming college application deadlines, and both participants and spectators were left feeling buoyant!